Today I went snorkeling at Corona del Mar to work on my Environmental Science project. It’s the same as my scuba project in case you read that post. I went with my friend Makenna, who I’m partnered with for the project, and our teacher. I wasn’t expecting to go today because we forgot to follow up with our teacher to verify going today, but I skipped practice and made it work. 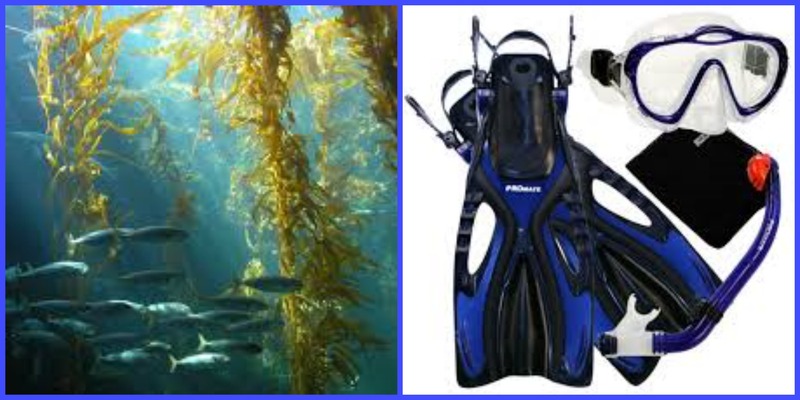 We borrowed equipment from the scuba instructor and borrowed some wetsuits at the last minute, went down to the beach, and prepared to snorkel out to the kelp beds to observe what we needed. We didn’t gather any data today, but we plan on doing that another time. It was a lot more fun than I thought it would be. Getting in the water was probably the biggest struggle because we were trying to put our masks on while getting knocked over by waves, and the fins did not help with balancing. I’m sure we all looked really great flailing around to try to stay on our feet! It made me wish we could have class like that everyday. It was nice to be able to work hands on outside of the classroom. I also thought that I would get freaked out by the kelp, but I didn’t. Once I was surrounded by it, it felt more soft than anything. Plus I was wearing a wetsuit so I couldn’t really feel that much of it touching me. We observed the kelp to see what we could use to determine how healthy the kelp is. We decided that seeing if the kelp is bleached is a sign of unhealthy kelp and kelp with white specks (which are colonies of something that’s name slips my mind right now) is a sign of healthy kelp.